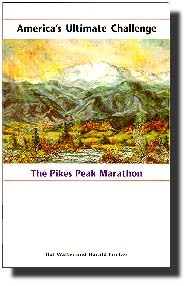 100 copies of a Pikes Peak running book found and sold!!! Ever since putting my Pikes Peak Library on the site people have been asking me about this book. Many people did not even know the book existed. For those that did, most (including me) thought that it was no longer available. As it turns out, a box of 120 were collecting dust before finally being turned over to the Pikes Peak Trails and Open Space Coalition who had sold about ten of them over the last year. I do not know how many or even if there are any more of these books out there that have not been sold. I purchased the remaining books that the Trails Coalition had  which raised $800 for them  and resold them to raise money for the nonprofit organization Friends of the Peak, a group dedicated to preserving, protecting, and restoring Pikes Peak. The price of the book was $14 with $8 going to the Pikes Peak Trails and Open Space Coalition and $6 going to Friends of the Peak  which raised $600 for them. Absolutely NO money went to me! My goal was simply to get a great book in the hands of peak runners while at the same time raise some funds for both the Trails Coalition and Friends of the Peak. This is the 40th anniversary book put out for the 1995 race. Starting with a brief history of Pikes Peak itself, the book then goes on to an overview of the early races on the mountain. The training tips section reveals some of the secrets of the top runners  from how they train to what they wear is covered. The untold stories tells of runners getting lost on the course and the keyhole short-cut that a runner used to set a bogus record that stood for 16 years until the record  was broken in 1992. Another story tells of the entrant who asked if he would be allowed to carry a pistol or a knife in case of bears or snakes. Pretty much all the Pikes Peak running bases are covered in this book! Many running photos from throughout the races history  just seeing the shoes and socks they used to run is enough to make you train harder. Appendix: I) Pikes Peak Marathon and Ascent Champions. II) Pikes Peak Ascent and Marathon Records. III) Trivia from the Pikes Peak Marathon Archives. IV) Memories and letters from Pikes Peak participants. V) Facts about Manitou Springs. VI) Entering the Pikes Peak Marathon. Buy the books which will raise $800 for the Trails Coalition. Resell the books which will raise $600 for Friends of the Peak.